Russell Hudson shows how woodworking can be used to dress up and renovate an otherwise uninteresting wall. This house was constructed in the late 70's. 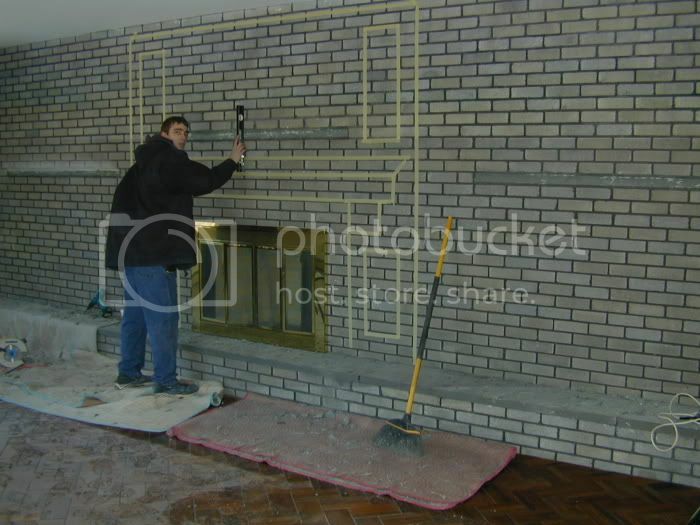 The living room's long fireplace wall was made entirely of white cement 'bricks' with black mortar lines between, which was neither warm nor inviting--(much less good-looking!). The new owners wanted the entire wall faced with display and storage cabinetry to surround the fireplace, with a new mantle piece to match. The only thing we left exposed was the stone firebox surround and the hearth's stone cap, which ran the whole width of the room. In this first photo you can see the wall being prepped (the original bluestone mantel and shelves chiseled off) and tape indicating the position of the new woodwork to be accomplished (mantle, wall panels and the outside edges of the cabinets left and right). This allowed us to get a sense of how it would look in both size and proportion. 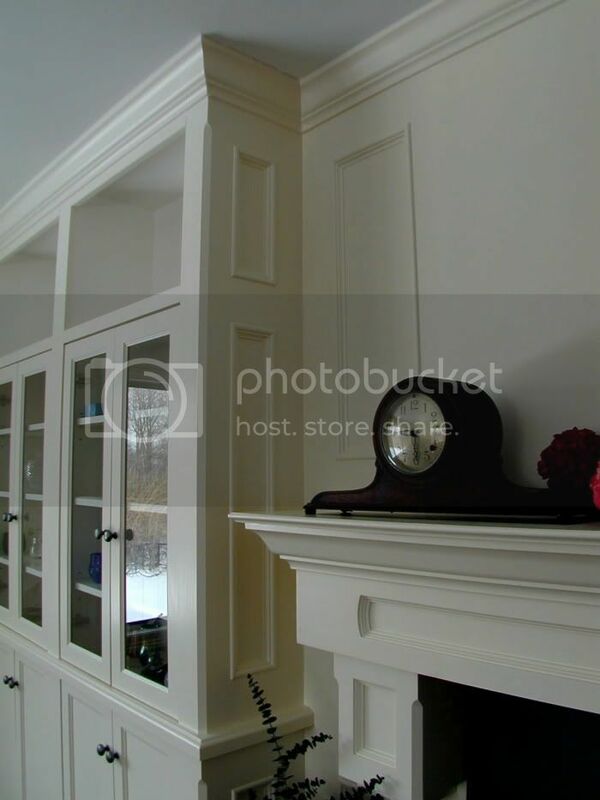 The homeowners wanted well-articulated woodwork but with bold details, rather than fine decoration. The finished product should be somewhat masculine, including straight lines, and should be substantial. 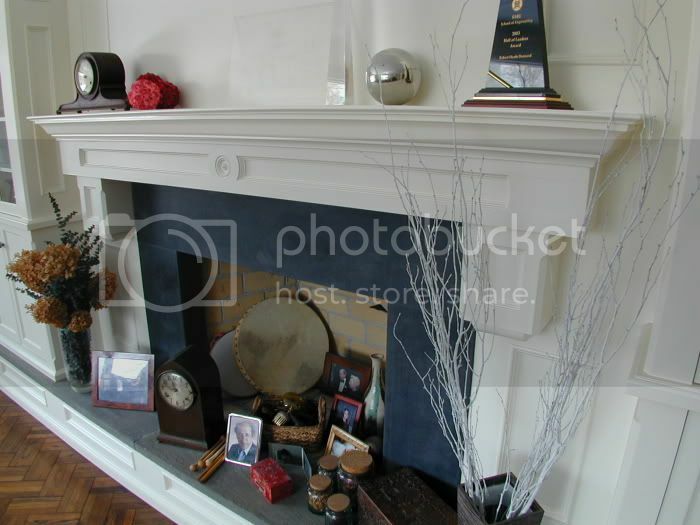 To accomplish this effect, we created block-like corbels for the mantle rather than columns. All of the surfaces were paneled, and a single, large rosette was machined into the face. All surrounding wall surfaces were paneled as were the cabinet's side walls. These are true 'frame & panel' surfaces, rather than simply rectangles of applied molding, which is commonly seen in many installations today. Each of the panels sits 1/2" below the surrounding wall surface (frame) with the inside molding placed on the panel and rising 1/4" above the surrounding frame, providing a richer effect. We also chose to insert glass in the upper doors. As is often the case, they were pleased enough that they asked us to do two more projects for them. Their home is much cozier today. I hope this article will provide some ideas for the rest of you woodworkers out there. Please find me on the forums and/or visit my home page, which is accessible under my name. Russell Hudson / Hudson Cabinetmaking, Inc. I would assume you used poplar for the construction. Looks great. Breathtaking! Wow is that gorgeous! Outstanding! The design and workmanship is top notch. Great results. This is a huge improvement, and should really provide a high return on investment for the home owners. Thanks for sharing before and after photos too. But I Love Stained Wood. A terrific eye for design. Craftsmanship looks topnotch. Yup. The right choice for painted work (in the northeast, anyway). You got me. I don't understand why they inadvertently chop off some width when it becomes an article. WOW can't get my mouth shut Absolutely terrific! 1. I totally agree that it was an uninteresting wall. 2. The end result is stunning, a great example of your workmanship, and something to be especially proud of. I really love the continuous hearth and the moulding on it. It just ties everything in. Did you ever consider leaving some of the brick exposed during the design phase? I'm glad you didn't. Good call, and excellent design. Definitely a finished project to be proud of, very very nice. I love the large space above the doors. I just love the design! From an uninteresting wall to a beautiful fire place and cabinets. The cabinetry looks great. I might have been tempted to just close in the area where the fireplace is and fill in the space with more cabinets. Found a used Supermax 19-38 combo for 1900 with the nylon head. They're pretty much standard mechanisms with articulating arms connecting to the doors.